Today, darthmaz314.com brings you our first Walt Disney World Video Featurette, a new segment in which we share video clips filmed in Disney by yours truly. 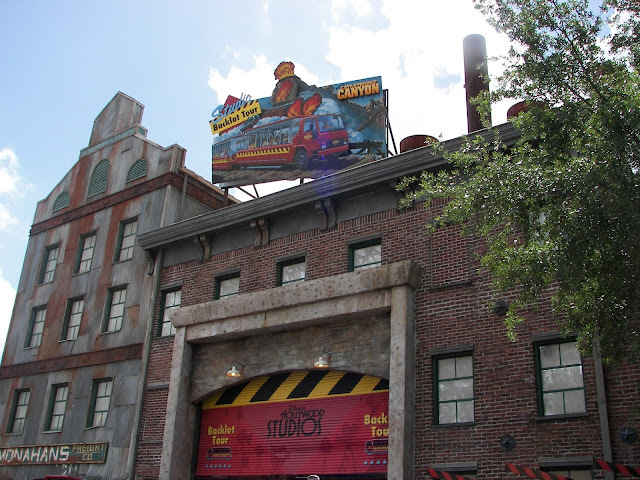 For our first WDW Video Featurette, we present the Catastrophe Canyon segment of the Disney Hollywood Studios Backlot Tour. Catastrophe Canyon is the highlight of the tram portion of the tour in which the tour vehicle "wanders onto a hot set" where an FX shot is being filmed. This staged FX shot features in-your-face intense pyrotechnics, a simulated earthquake, and deluge water effects. darthmaz314 helpful hint: The Catastrophe Canyon segment of the Backlot Tour can be intense for small children. If you are unsure of whether your kids can handle the intense effects, it may be best to skip this portion of the tour. If you do venture on the tram, seat your small ones on the extreme right side of the tram, as this will place them the farthest from the fire and flood as the can be while on the tram. Considering that there is great speculation regarding the possible elimination of the Backlot Tour to make room for future park projects such as the rumored Star Wars Land and/or Carsland, Catastrophe Canyon may be one day be a Disney memory that you cannot relive on future visits.